The Lions play their final midweek game of the tour against the Hurricanes tomorrow morning. Henshaw will start his fourth game of the tour on Tuesday. THE FINAL MIDWEEK game of the tour, and with it perhaps the last chance for the players on the periphery to force their way into Warren Gatland’s thinking ahead of the remaining Test matches. The Lions head coach has already strongly suggested that changes will be made for the second meeting with the All Blacks this Saturday, thus giving those involved against the Hurricanes on Tuesday morning [KO 8.35am Irish time, Sky Sports 1] added incentive to push their case for inclusion. By no means is the door shut, as we saw last week when Liam Williams and Elliot Daly, both of whom weren’t in many people’s Test XV, were surprise inclusions in Gatland’s side off the back of standout performances against the Chiefs. Robbie Henshaw knows that can be him this week. “You have to be on your toes for the duration of the tour,” he said. “If you do perform you get a chance so the onus is on us. You need to be ready. If you put in a good performance that will be recognised. “There was definitely a few shocks when the team was read out [last week], and Liam Williams had a brilliant game and Elliot Daly too. Tuesday’s game in Wellington will be Henshaw’s fourth start of the tour having featured in the midweek outings against the Auckland Blues, Highlanders and Chiefs. 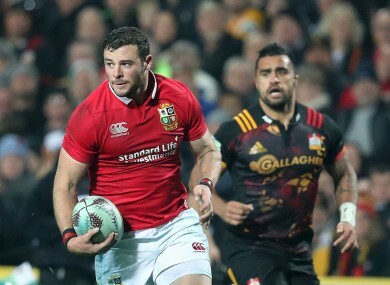 While we’ve seen glimpses of what the Leinster centre can bring to the Lions midfield, we’re yet to fully see Henshaw in full flow but he’s hungry to show Gatland what he can offer at the Westpac Stadium. Brushing off talk of fatigue at the end of a long season, the 24-year-old is relishing the prospect of pulling on that red jersey again against the defending Super Rugby champions. “I think you just dig deep, it’s the excitement about the whole thing,” he continued. “You might never get on a Lions tour again, and you have one opportunity to play in the Tests maybe. Rory Best skippers the Lions again and is one of four Irish, including Henshaw, set to be involved from the start tomorrow with Iain Henderson and CJ Stander named in the XV. The Hurricanes, meanwhile, have welcomed All Black squad members Julian Savea, Jordie Barrett, Vaea Fifita and Ngani Laumape back into their starting XV, which also includes Nehe Milner-Skudder and the in-form Vince Aso. Brad Shields captains the side from number eight, with New Zealand U20s scrum-half Kemara Hauiti-Parapara set for his debut off the bench. It will be a stiff challenge for the Lions as they go in search of a morale-boosting victory. “We need to step up, take the reins now and put a positive back into our camp and get a result for the other boys,” Henshaw added. “We’re gelling better as a unit now. You just need to be ready with what they throw at you, they were very dominant in the close areas off nine on the weekend. Email “'Stand out, play well and you will be looked at': Henshaw knows Test door is far from shut ”. Feedback on “'Stand out, play well and you will be looked at': Henshaw knows Test door is far from shut ”.